2218 1/17, 16/30, 1A, 1 German Demokratic Republik (East Germany) / service - lovely mint never hinged collection the official stamps, nearly complete with many key values on Schaubek pages with mounts formed. As well service Michel no. 1 / 17 (Michel 250,- €), 30 / 33 (Michel 700,- €), as well a very nice part course control receipt of the ZKD including Michel no. 16 / 30 with all 17 values (Michel 400,- €), 31 / 45 with all 84 values (Michel 2800,- €), 46 / 60 with all 84 values (Michel 3000,- €), as well also confidential offical matter Michel no. 1 A (Michel 250,- €), letter with proof of delivery Michel no. 1 (Michel 300,- €) and so on. A wonderful quality object! 2256 German Demokratic Republik (East Germany) - 1949 / 83, very nice mint never hinged collection, in the number of a major listing complete, clean and maintained in five blue Borek hingeless printed form albums. 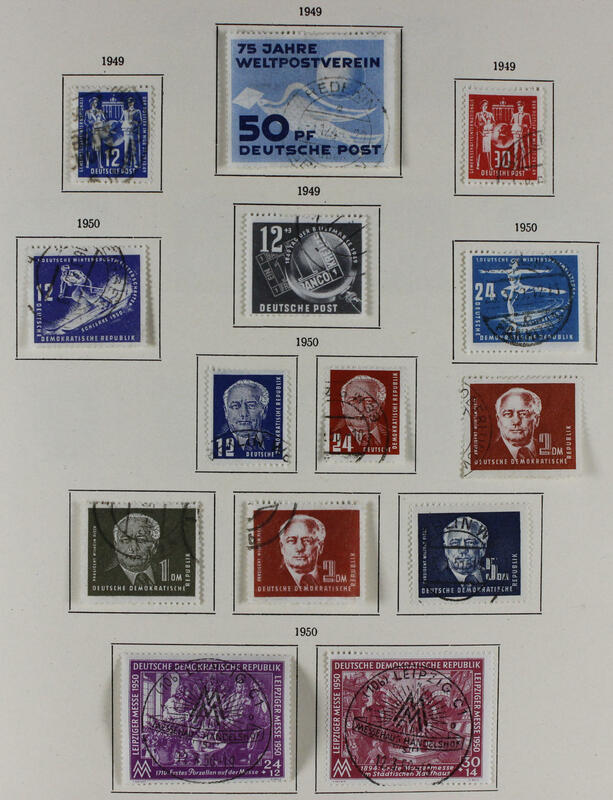 And, of course, all first issues including academy 1950, DEBRIA-souvenir sheet, German Chinese friendship, heads set with German Demokratic Republik (East Germany) watermark (25 Pfg. Expertized Paul BPP), five year plan sets, all fours Marx souvenir sheet and so on. Additional are as well various special feature available as for instance se-tenants, special prints and so on. A very nice object! Michel approximate 5400,- €. 2273 ⊙ German Demokratic Republik (East Germany) - 1949 / 68, an exceptional nice and cultivated used collection, in the number of a major listing complete in the KABE illustrated album. 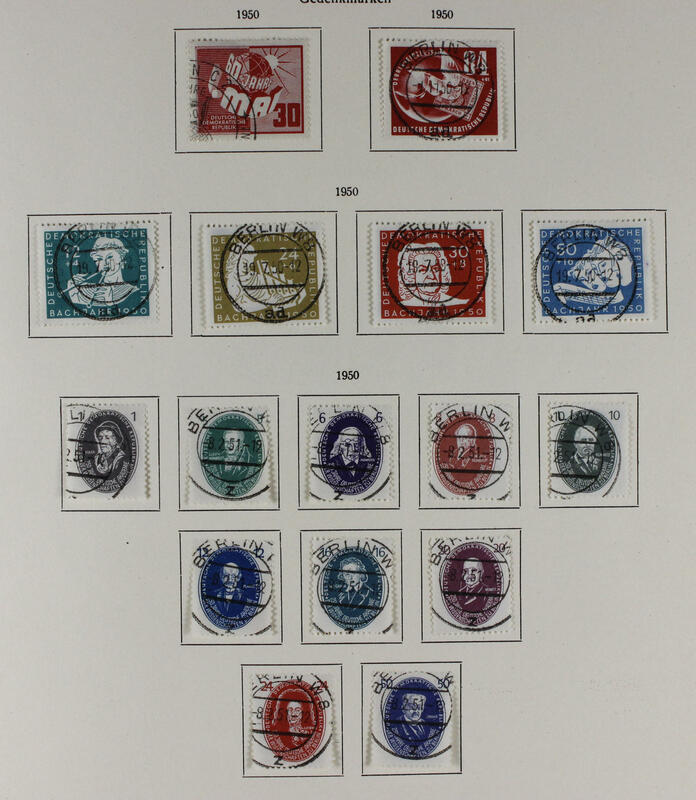 As well especially many issues of the early years with very nice centric postmarks, all fours Marx souvenir sheet with appropriate special cancel, Engels-souvenir sheet with special cancel and so on. Additional are as well numerous official stamps available. A wonderful quality object! 2275 German Demokratic Republik (East Germany) - 1975 / 87, huge mint never hinged inventory en masse fifty-page album accommodated, all close one above the other puted. As well a huge number blocks of four from the corner, souvenir sheets and miniature sheet, margin copies and corners of the sheet, printers marks and so on. Huge catalogue value! 2295 /⊙ Jan 17 German Demokratic Republik (East Germany) / service - rich collection the official stamps in the thick Lindner ring binder specialized formed. As well better issues, the normal official stamps including Michel no. 1 / 17 mint never hinged, watermark-variants, printers marks, as well also the course control receipt extensively present with sought-after issues, different types and so on. A magnificent object this attractive area with very high catalogue value! 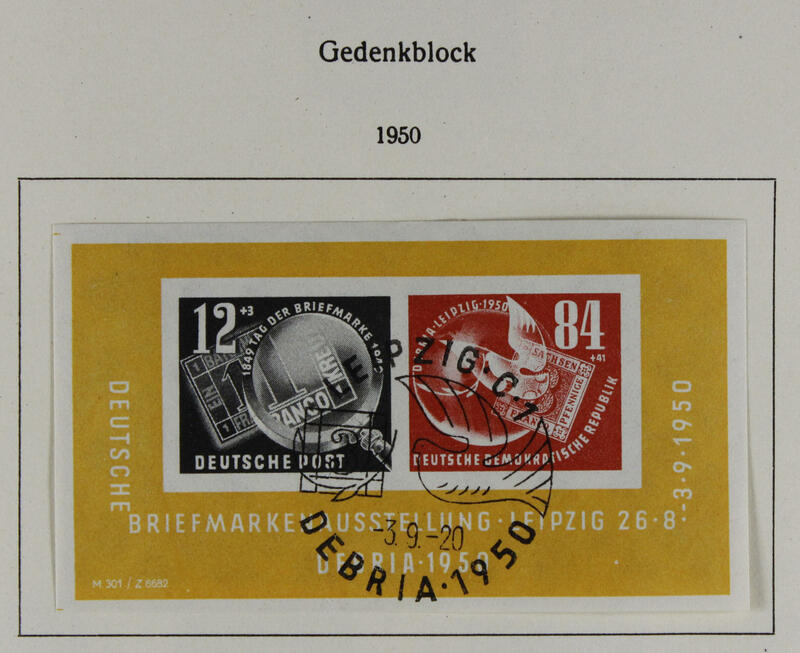 2383 ✉ German Demokratic Republik (East Germany) - interesting collection from covers and cards with single- and multiple franking of the issue buildings and monuments 1990. With also two scarce single frankings the 10 Pfg. On correctly franked postal matter airmail letters to France (Michel 300,- €), further better postage steps, various use form and so on. An attractive object! 2439 /⊙/ German Demokratic Republik (East Germany) - 1949 / 90, extensive collection, twice collected in three thick Lindner ring binder, in both conditions in each case nearly complete, all mainly mint never hinged respectively neat cancelled, few unused. With also academy 1950, DEBRIA-souvenir sheet twice, all fours Marx souvenir sheet, Five Year plan series, many further better souvenir sheets, blocked value sets and so on. Michel approximate 6000,- €. 2463 German Demokratic Republik (East Germany) / se-tenants - 1959 / 90, very nice and extensive mint never hinged collection of the se-tenants in two thick Borek hingeless printed form ring binder, almost completely formed. Many better issues, complete se-tenant sets and so on. With also all se-tenants world festival 1962, Leipzig fair 1965, olympic games 1964, traditional costumes 1964 and so on. A very nice quality object! 2464 German Demokratic Republik (East Germany) - 1949 / 90, very nice mint never hinged collection, in the number of a major listing except for souvenir sheet 7 complete in six blue hingeless printed form ring binder. With also academy 1950, German Chinese friendship, heads set with German Demokratic Republik (East Germany) watermark (25 Pfg. Expertized Mayer BPP), Five Year plan series, all fours Marx souvenir sheet and so on. A maintained object! Michel approximate 5350,- €. 2465 ✉ Jan 40 German Demokratic Republik (East Germany) / service - extensive special collection from commercially used letters the official stamps (administration postal service B) in the ring binder, from Michel no. 1 / 40, with in total 120 covers and cards. Many attractive documents, various postage steps, single- and multiple franking, registered, different cancellations, letter with proof of deliverys and so on. Rarely offered in this richness and diversity! 2467 x German Demokratic Republik (East Germany) - enormously extensive inventory in 10 large albums respectively stock books accommodated, mainly mint never hinged respectively used, very few unused. As well enormously many complete years, an extensive part souvenir sheets, good part first issues including academy 1950, German Chinese friendship, many further better issues from the fifties, numerous blocked value series and so on. Enormously high, five-digit catalogue value! 2541 /⊙/ /✉ German Demokratic Republik (East Germany) - 1949 / 90, very nice and extensive collection specialized formed in six ring binder with an enormous amount of material. As well are the number of a major listing complete available including the beginning valued as for instance academy 1950, DEBRIA-souvenir sheet, German Chinese friendship, all fours Marx souvenir sheet and so on. Additional are as well numerous documents available including illustrated First Day Cover, as well a part service- and ZKD-editions. Subsequent another extensive mint never hinged part se-tenants including complete sets, as well special stamp booklets and so on. An extensive object with very high catalogue value! 2542 German Demokratic Republik (East Germany) / se-tenants - 1949 / 90, very nice and extensive mint never hinged collection of the se-tenants in two large thick stock books formed with numerous sought-after combinations, mostly complete se-tenants sets. With also world festival 1962 with all 16 se-tenant, olympic games 1964 with all 24 se-tenant, Leipzig fair 1965 with all 16 se-tenant, traditional costumes with all 24 se-tenant and so on. A wonderful quality object with very high catalogue value! 2543 ✉ Jan 15 German Demokratic Republik (East Germany) / service - extensive special collection from commercially used letters the official stamps B (administration postal service A) from Michel no. 1 / 15 in two ring binder formed. 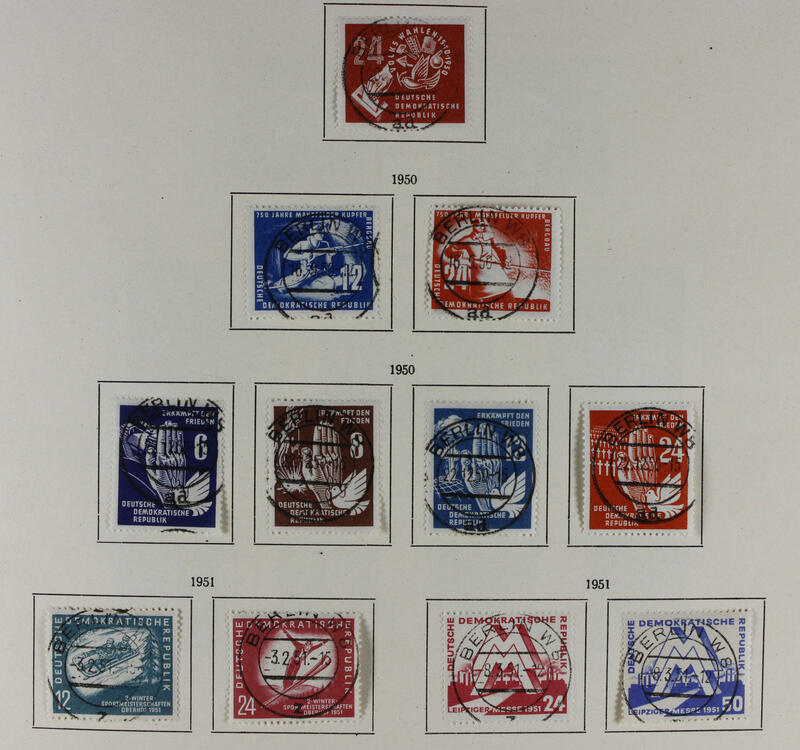 The extraordinary collection includes 155 covers and cards with many attractive documents, interesting frankings and cancellations, different state company, single- and multiple franking, different numbering and so on. Hardly ever offered in this richness and variety! 2544 ✉ German Demokratic Republik (East Germany) / service - extensive special collection from post paid official letters with numerous interesting cancellations, in total 392 documents in four ring binder formed. As well an abundance different offices, places, cancellations the sender adress in different colours and so on. Rarely offered in this richness and diversity! 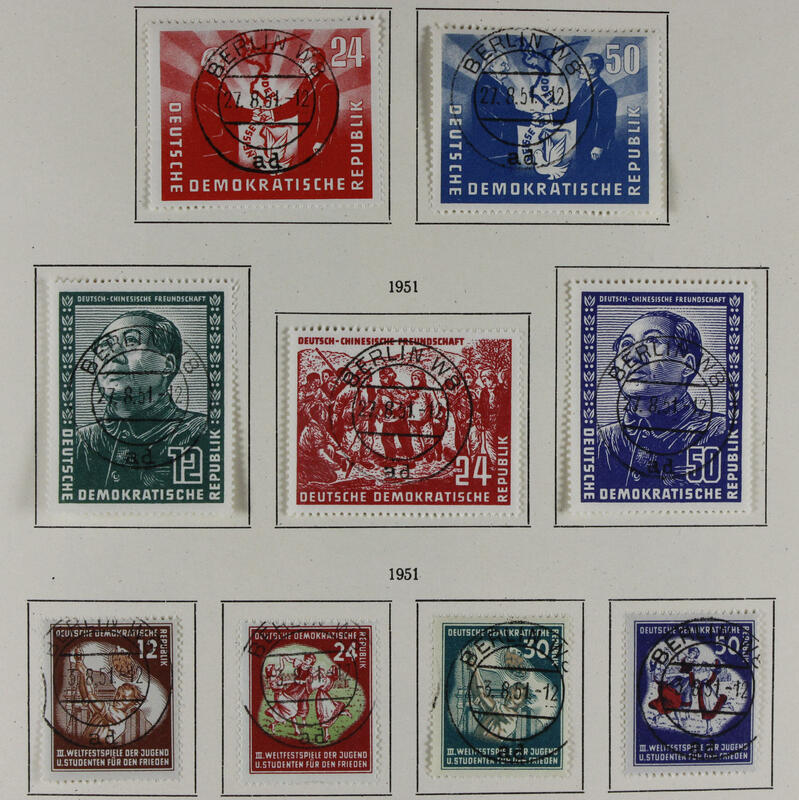 2608 / German Demokratic Republik (East Germany) - 1949 / 90, rich collection, in the number of a major listing complete in four Schaubek illustrated albums formed, all mainly mint never hinged, few issues are unused. 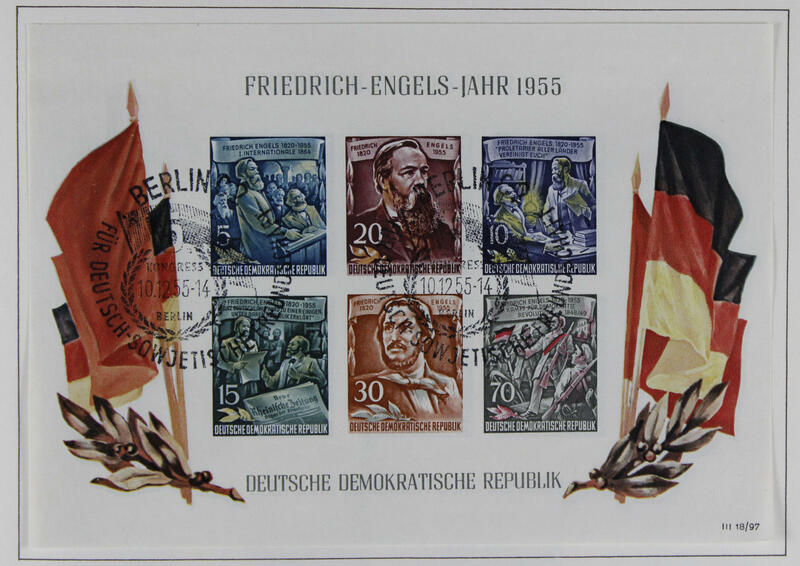 Included are naturally also all key values of the early years as for instance DEBRIA-souvenir sheet, German Chinese friendship, Five Year plan series, heads set with German Demokratic Republik (East Germany) watermark, all fours Marx souvenir sheet and so on. Favorable opportunity! 2609 ⊙ 327/41 German Demokratic Republik (East Germany) - 1949 / 90, very nice used collection, in seven blue KABE hingeless printed form ring binder. The collection is except for souvenir sheet 7 / 9 and Michel no. 327 / 41 in the number of a major listing complete available including academy 1950, German Chinese friendship, souvenir sheets 10 / 15 and so on. Michel approximate 3500,- €and original price the albums approximate 700,- €. 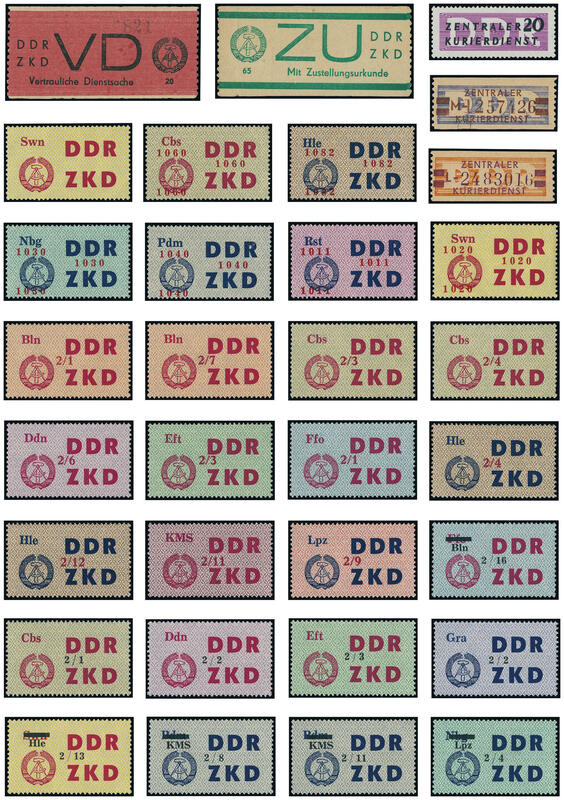 2658 ⊙/ / German Demokratic Republik (East Germany) - very interesting and rich collection from the beginning years in two ring binder formed and clean made up with inscription. 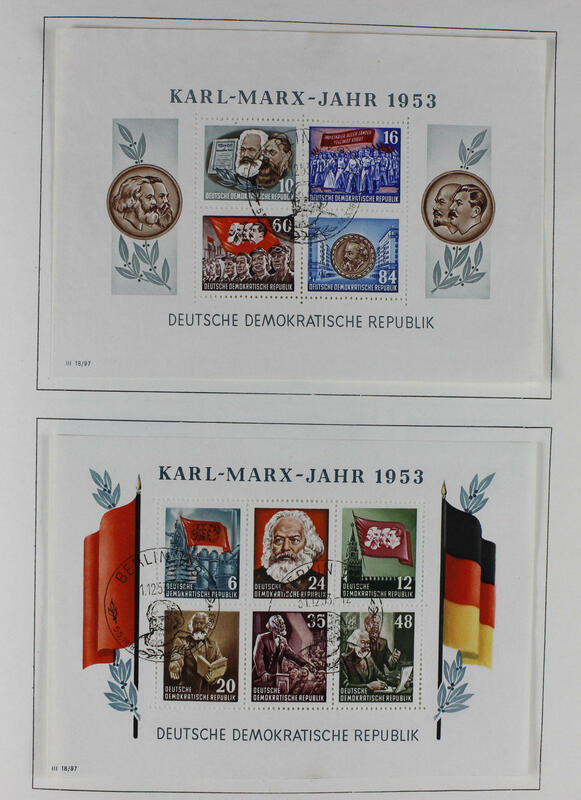 As well numerous better issues as for instance DEBRIA-souvenir sheet with appropriate special cancel and on magnificent First Day Cover, German Chinese friendship, all fours Marx souvenir sheet, further souvenir sheets issues, academy 1950 and so on. Interesting object! 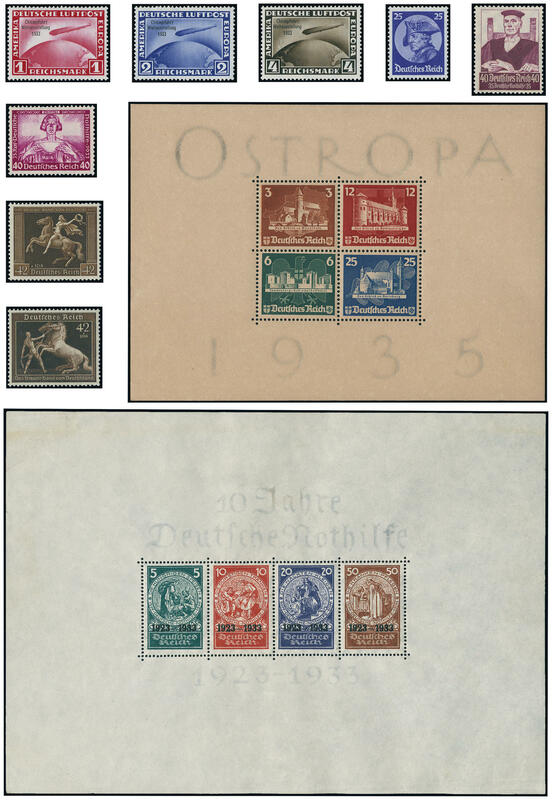 2659 / German Demokratic Republik (East Germany) - 1949 / 90, nice collection, in the number of a major listing complete in three hingeless printed form albums, all mainly mint never hinged formed, few issues are unused. 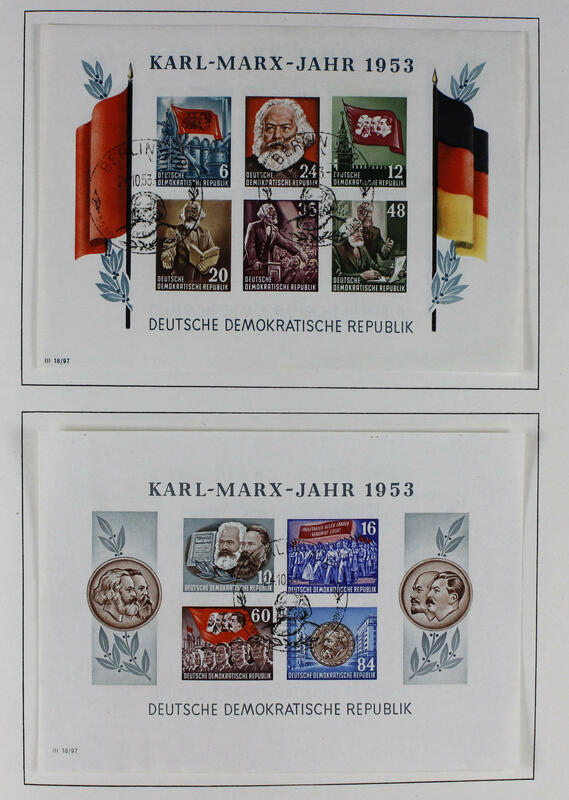 Included are naturally also all first issues as for instance academy 1950, DEBRIA-souvenir sheet, German-Chinese friendship, heads set with German Demokratic Republik (East Germany) watermark, Marx souvenir sheet, Five Year plan series and so on. Favorable! 2685 /⊙/ German Demokratic Republik (East Germany) - 1949 / 90, extensive inventory in nine large stock books accommodated and clean chronologically sorted with enormous amount of material. Thereby also extensive part first issues including German Chinese friendship, souvenir sheets, enormously many blocked value series and so on. Favorable valued inventory with gigantic catalogue value!